To be fair Australia displayed some fight on the fifth day. Khawaja’s 97, Peter Nevill’s four hour 60 not out and the tail’s resistance showed some much needed spine. South Africa deserve the accolades though. Man of the Match Kagiso Rabada. Wow. The 21 year old from Johannesburg averages under 25 with the ball from his first 9 Tests and looks a real gem. After Steyn’s withdrawal Rabada shouldered a big workload with seam partner Vernon Philander who – as an overweight medium pacer – continues to defy the odds and take lots of wickets. But it’s the young guys that will excite South Africans. Rabada spearheaded a group of 5 under 30 who made definitive contributions in Perth; Maharaj, de Kock, Elgar and Bavuma. The future looks bright for Protea cricket. He has played 8 First Class matches and 1 Test Match since 2011. Maybe its time to move on and focus on nurturing players from the youth teams? Or feature stories from the Sheffield Shield? In other cricketing news; India host England for 5 Test matches beginning on Wednesday in Rajkot. Rain nearly saved Pakistan and it should have saved India, but it denied both sides a reprieve and ensured thrilling finales to two Test Matches over the weekend. England’s destruction of India at Old Trafford was stunning and the quality of cricket on display at the Galle Fort in Sri Lanka was just as fine. The standard was high in (Cape) Townsville too, where South Africa A hammered Australia A in a solid game of cricket at the Riverway Arts and Cultural Precinct. South Africa might have found a replacement for Jaques Kallis. Actually, cancel that. Kallis is irreplaceable. But, they may have uncovered a future Protea. Rilee Rossouw nailed a superb 231, which killed Australia A’s hopes on a wicket that saw them bowled out twice in four days. Rossouw averages 45 from 72 First Class matches and must be on the edge of Test selection. Temba Bavuma asserted himself with a grafting 162 and Australia A – consisting of 5 internationally capped and 3 Test Match capped players in Phil Hughes, Moises Henriques and Mathew Wade – simply couldn’t match South Africa A. The visitors attracted plenty of vocal support too with many local club cricketers attending, enjoying a few beers and creating a bit of good natured atmosphere from the hill. But, could the crowds be better? If the small crowds during match 1 are anything to go by, then it would seem that Cricket Australia, Townsville City Council and perhaps the local cricket administrators could do more on the promotions front. On Friday afternoon that little stadium should be heaving with blue and white collar workers and it wouldn’t take much imagination or creativity to spark interest and greater involvement from local businesses and large employers. On a positive note, Cricket Australia announced today the sport has one million participants in Australia, a great result that should be the basis for further expansion. The two A teams go at it again in Townsville this week beginning on Thursday 14 August. Peter Forrest and Clint McKay have been added to the Australian side and Phil Hughes has taken the captaincy off Moises Henriques who is out injured. 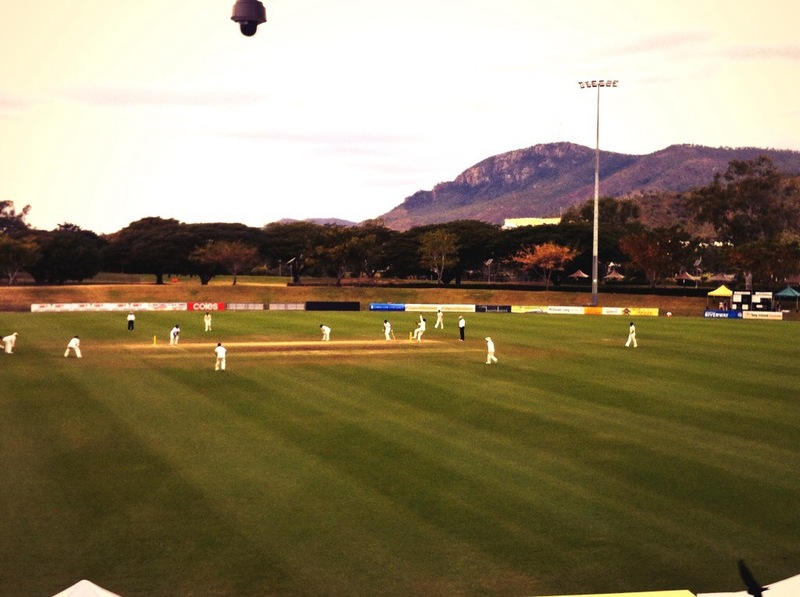 The scene in Townsville resembles Newlands in Cape Town as Gurinder Sandhu steams in and attempts to get a much needed wicket for Australia A against Sth Africa A. On the Test scene India’s weak surrender to England on the third day in Manchester has created an alarming dilemma for MS Dhoni: where to find players who want to fight? India only needed to survive one afternoon. It absolutely pissed down with rain all of the next day. I mean, blokes were chipping catches to short fielders and trudging off as if preferring to escape to the hotel games room. Unbelievable. England’s bowlers were good, but not quite this is an unplayable Mitchell Johnson who’s going to kill you good. Two weeks ago India led the series 1-0, perhaps mostly because England were poor and lacked tactical direction. Since then India have been reclassified as an invertebrate species and England have reacquainted with the spinal column and retaliated with more discipline and application. Leading 2-1 England can’t lose the series now, at worst they’ll draw it if India bounce back, but England should win 3-1 with a resounding victory at The Oval Test, which begins Friday. 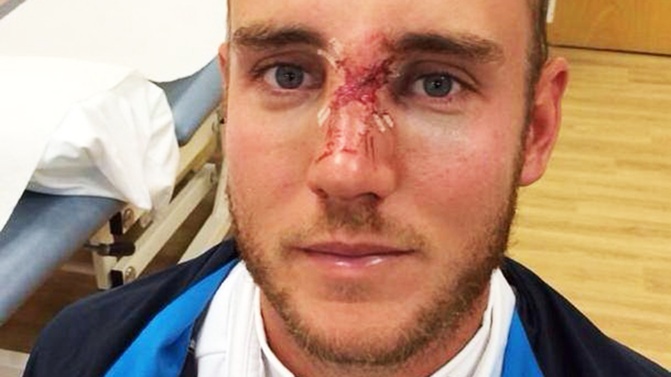 Will England miss Stuart Broad if he fails to play after breaking his nose? Probably not. Moeen Ali will simply take another 5 for and finish the job Jimmy Anderson is likely to start. Perhaps the most startling result occurred in Sri Lanka. Wow. Is Test Cricket alive or what? Pakistan made 451 in the 1st innings with Younis Khan amassing 177. Bang that’s it. It’s going to be a draw. The Galle wicket will be a road. Sure enough Sri Lanka pump out 533 and you’re thinking, yep, draw. But, here comes Sri Lanka’s spin king Rangana Herath and there goes Pakistan for 180 on the final day. A lead of only 98. 126 balls remain in the Test Match, are they going to go for it? You betcha. They peel off the runs with 5 overs to spare. Seconds after the celebrations begin the rain falls on the Dutch fort and rolls across the ground. Pakistani players were last seen kicking the ground, while locals danced and sang in the rain. One of the great Test victories. No I haven’t forgotten to mention Kumar Sangakarra… he smashed 221 in Sri Lanka’s 1st innings, his 37th Test Match tonne. He averages 58 from 125 Tests. In fairness Sri Lanka don’t play as many top line Test Matches as Australia, England or South Africa, but he would waltz into any of those nations’ teams and score just as many. A timeless legend. At the Harare Sports Club Zimbabwe made a competitive 256 against South Africa who are 4/201 in reply. It is great to see Zimbabwe back in Test Match action and so far they are holding their own against a rebuilding, but still very good South African team.